flood prone areas. Visit www.ci.janesville.wi.us to check it out. as they can add new ones). No matter where they live, residents must bring their own shovels. ~ Town of Janesville residents can go to the old barn, near the intersection of Hwy 14 and West River Road. respective town hall. Call Milton Town Hall at 868-2465 and Fulton Town Hall at 868-4103. Shut off electricity/gas to areas of the home that might flood. off your electricity. Information provided by Homeland Security. closed. 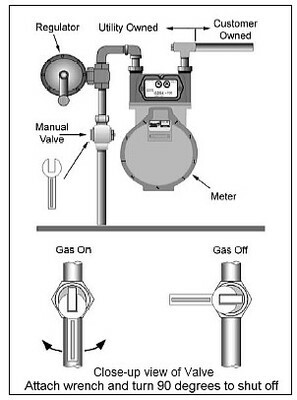 The valve is open or "on" when the handle is parallel to the gas pipe. the gas valve. If you have a fuel oil tank, shut the supply valve off at the tank. water or boiled water for washing, drinking and cooking. goggles or protective eyewear, disposable full body clothing, head gear, rubber boots. Website that sell these items. Be sure to use disinfectants on hands, especially before eating. helps to dissipate any residual fumes and will help to begin reducing moisture levels. mold growth. If you have a substantial amount of water, you need to remove water slowly and carefully. This includes paint, oil, cleaning supplies and other dangerous materials. of the bottom shelves and move to higher places. property. This checklist can help you prepare to reduce the severity of flood and water damage. system may overload the system and cause sewage backup; plus it may be illegal. A flexible rubber ball about 1 & 1/4 the inside diameter of the pipe can be wedged into the drain to create a tight seal. expands to fill the pipe when the top and bottom metal plates are squeezed. Place a partially inflated inner tube around the drain, and top it with a square or two of plywood (not particle board). drain. Be prepared for some seepage. and capped or plugged with braced rubber balls. carry the water away from the house. Using salt or a chemical to melt them free will probably damage the lawn. the silt won't so cleanup will be easier. and other water borne bacteria. Do not throw away materials until you access whether they are salvageable or not..
floors and ceilings. Check bearing locations for movement or settlement. Clean and repair the structures roof and roof drainage system in order to protect the building from further damage. inspect hard ceilings that may be wet. Dry or remove all wet ceiling tiles and gypsum board. materials, remove wet insulation from cavity wall construction. other wirings. Inspect your insulation. If it is wet, it will need to be removed and discarded. Prior to disturbing wall systems, determine if asbestos is an issue. boards and baseboards and drilling a drain hole through the plaster and lath near the bottom of each wall cavity. paneling, remove them to allow natural drying. Provide ventilation by opening windows and doors and using fans. are dry. Wet wood becomes soft and easily damaged. If the flooded water contained sewage, everything will need to be sanitized, as well. floor. If you have a crawl space, remove any plastic sheets, vapor barriers, or insulation from underneath the floor. Reapply only after the floor and foundations are completely dried. use fans for dry-out before determining that the water is clean and sanitary. a steam leak and the shape of the tile has not been altered. In this case the ceiling tile can be air-dried and reused. These surfaces can be kept and cleaned to remove stains and mold growth. These hold water and wicks water up inside a wall. It must be removed if wet to prevent mold and decay. should be removed from the wall for inspection and drying. carpet, discard it for health safety reasons. Also discard if the carpet was underwater for 48 hours or more. flooring if you detect signs of mold. few feet you will be able to reduce buckling caused by swelling. These can be kept but must be cleaned properly. drawers. Discard wood pieces if severely damaged or if you detect signs of mold. external insulation, they can be cleaned and retained. Again, as a general rule, anything you cannot wash and disinfect should be thrown away. 24-48 hours. If you find signs of mold, discard the item. This can be salvaged if dried thoroughly within 24-48 hours and no mold growth is found. water and is hard to dry. These should be discarded. The exception would be if the furniture has become wet due to a steam leak. water damaged books, documents, artwork, and photos in a frost free freezer or meat locker for a later treatment. These can mostly be dried and restored using different techniques depending on the different type of fabric. disinfect, discard any item a toddler or baby might put in his mouth. These can usually be washed and salvaged but must be discarded if drenched or heavily contaminated. and leftovers that have been above 40 degrees F for 2 hours or more. determined, purify all cooking and drinking water. Generally, if an item was damaged by mold and cannot be cleaned, it must be discarded. helpful if you are indecisive about high value or sentimental items that have been affected by mold. area (55% or higher) then you should strongly consider a dehumidifier. What to look for in a dehumidifier. To determine the relative humidity, you will need a sensor. Relative humidity sensor. prevent it from drying as dry mold spores have a better chance of becoming airborne during the cleaning process. spores can be invisible and remain dormant for months. some materials it may take even longer. headaches, fatigue, eye nose and throat irritations, and skin disorders. buildings worldwide may be the subject of excessive complaints related to indoor air quality. manner that is conflicting with its original design or approved operating procedures. caused by poor building design, poor ventilation, and improper occupant activities. distribute air to people in the building. insect or bird droppings. These are usually easier to detect and eliminate with proper maintenance. pollution sources: adhesives, carpeting, cleaning materials, copy machines and printers, wood products. can cause an endless list of health problems, including lung infections. Symptoms of mold exposure. value decrease due to the contamination? Do I really have to report an old mold problem that is now fixed? buyer's perception of a particular type of contamination. non-contaminated property of the same standards and conditions. likely to address the issue based on facts and knowledge rather than judging it by an emotional feeling. likely change leading to a change in the impact of the stigma. unfairly lead to a lowered appraisal. Residents should be alert for scams related to flood clean-up and recovery. Here are a few fraud prevention tips. promise to speed up insurance claims. Honest companies and employees will have proper identification & insignias on their vehicles or uniforms. Check references. A reliable contractor will provide names of previous customers. Never pay for a service in advance. hotline: 1-800-422-7128 or visit their website. Preferred home Repair & Services, LLC., and use of such information is at the recipient's own risk. linked. You assume responsibility for your actions in regard to the flood information provided.